The perfect companion for your trip to Spain! 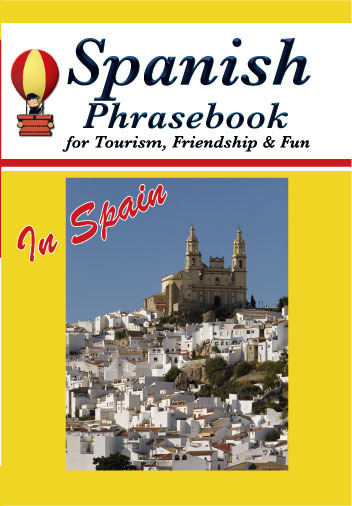 Whether talking with someone at an outdoor café in Alicante, making an acquaintance on a Torremolinos beach, bargaining with a shopkeeper in Montesa, or chatting with your neighbor on a train to Seville, you’ll be super glad that you have this broad-spectrum English-Spanish phrasebook to guide you along. participating in and watching sports such as basketball, soccer, team handball, skiing, ice skating, snowboarding, scuba diving, swimming, surfing, windsurfing, kayaking, boating, mountain climbing, equestrian sport, golf, tennis, track & field, skydiving, paragliding, boxing, wrestling, birdwatching, fishing, hunting, archery, paintball, field hockey, ice hockey, and many others. The book includes a HUGE Spanish-English glossary of food and drink.